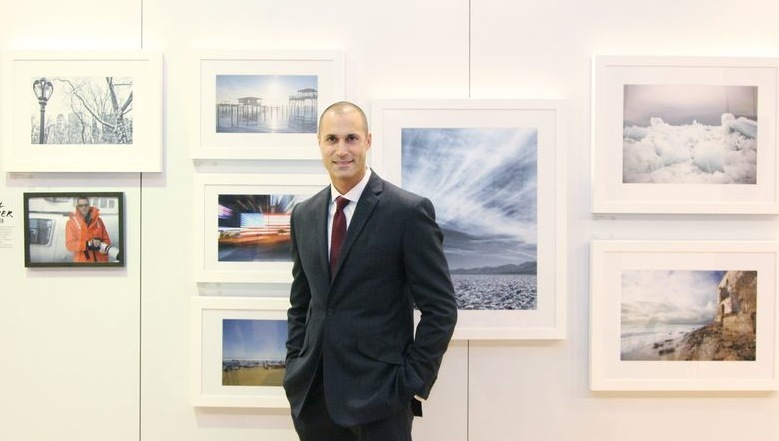 Photographer Nigel Barker has had two feet firmly on the ground of the fashion industry for the past two decades. In recent years he has stepped out of the fashion world to venture into the realm of photojournalism and humanitarian work. Barker was recently in San Francisco to promote his collection of work on Art.Com. His collection adorning the walls of Art.Com's pop-up shop in Union Square illustrates how Barker has turned his lens,famous for capturing the likes of Coco Rocha and Tyra Banks,towards world conflicts.Art Crasher had the opportunity to speak with Barker on this new chapter of his career that has brought him to Tanzania to document the fight against mother-to-child transmission of HIV, to the Arctic to explore Canada's annual seal hunt, and to Haiti to share the soul of an inspiring community in the slums of a place, ironically, called Bel Air. "My experiences in these countries changed me as an individual and opened my eyes as a photographer". As a photographer, Barker recognizes it is his job to make a photo look like a million dollars, but "How do you do that when you go to Haiti and people are having a lot of problems and a lot of distress? I look for people and situations that show hope, that show the human spirit, that show strength...Courage...Bravery. The pictures themselves are celebrations of these places.The celebration that is us. Photojournalism often concentrates on the disaster and the misery. It's important to know, but I think in order for us to heal and preserver, we need to know what else we are made of. The power of being able to conquer, that is what I look for." Before you attempt to discredit Barker for being a pretty face who got his start in an industry that is often labeled as selfish and privileged, you have to look at the risks he has taken with his documentaries and humanitarian work. Despite being warned by the U.S. government not to go to Haiti following the outbreak of the food riots in April 2008, Barker continued with his plans to travel to Haiti with his crew and good friend, Unik Ernest, to film "Haiti: Hunger and Hope". It was during a day of filming in a cemetery on that very trip that Barker found himself with his camera in his hands and a gun to his head. Locals felt Barker and his team were taking advantage of the community's misfortunes. In that moment, the gunman's mother ran over and begged "Please don't do this. I don't want to see more blood today. Your brother already died today." Barker and his crew put down their cameras and the young Haitian put down his gun. Barker credits his success in the fashion world for his transition into photojournalism. The audience he built through America's Top Model and The Face has enabled him to use his following to shine a spotlight on more serious issues. Barker is shedding light on the realities of not only global conflicts, but also of the fashion industry. He draws a fine line when it comes to airbrushing. "We all airbrush ourselves all the time. We don't roll out of bed and say 'Okay, I'm going out, I don't care how I look'. There is a difference, though, between airbrushing and manipulating. If a model has a zit, we'll airbrush it out. That zit won't be there in a week. You don't have to be a model to airbrush a zit. People use makeup to do that every day...But manipulation, to change someone's actual physical bone structure and make them skinner, or change their jaw, I think this is wrong because you're actually creating someone who doesn't exist. We're made to think we've average by, in many respects, an industry that has created this allure for a certain type of beauty. We're all unique individuals. I think thats what is so special about all of us." As an established photographer,Barker offers Art Crasher and aspiring artists insightful advice. "You have to be polarizing. You have to have an opinion. All too often people show me their photographs and ask 'What do you think?'. I can like something, but it doesn't mean its right. It doesn't mean it doesn't have a place if I don't like it. One of the things you see with any real successful artist is that they do it for themselves. The most important person who has to like it is themselves. To be a successful artist, you have to know that you've done it, that you've taken the picture and this is the shot." Barker pauses for a moment and looks at his work on the wall behind us. "I wasn't always like this. When I was a young man, I think I was just enjoying life, running from one great crazy situation to another in the fashion world, the high life and all of those types of things. It runs it's course. Sometimes I wish I had woken up to a lot of these things earlier. You look at how precious life is. You look at you own morality. All these things become very real."